Have a personalized "My Tennis Page"
Not sure if you have a USTA Account? If you are not sure that you have a USTA Account, try to login using your email address or USTA Account #. Then follow the instructions. If you are not a USTA Member, click "Create an Account" at the lower right to get started. Do you have an existing TennisLink ID or login? If you have a Team Tennis / Tournaments ID# or Flex Leagues Login then enter that information into the "Email Address" field. Have a USTA Account but no login or password? TennisLink gives you access to Tournaments, Leagues and other play opportunities. 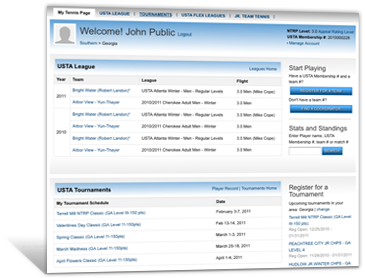 Create a free USTA account and start playing today! Call USTA Member Services at 1-800-990-USTA(8782) M-F 9 am - 9 pm ET, Sat 10 am - 6:30 pm ET, Sun 10 am – 3 pm ET or by email at memberservices@usta.com.